Most people walk around with poor mouth function. Their missing and damaged teeth make it too hard to smile, chew or talk. Stop these dental problems with our tooth restoration service. We provide tooth restoration with a custom look. With tooth restoration you won’t have clinical looking teeth. We complete tooth restoration using dental crowns. We use porcelain dental crowns to give your teeth a nice and clean look. Tooth restorations will give you great smiles and confidence for the next 20-30 years. Correct your missing teeth with our tooth restoration service. Dental crowns help us to repair your damaged teeth. We’ll fit your dental crowns in two visits. During tooth restoration we’ll remove harmful decay. We’ll shape your tooth and fit it with temporary plastic dental crowns. Your next tooth restoration visit will involve your final dental crowns being fitted and adjusted. Your new dental crowns will be cemented into place for long-lasting smiles and safe oral function. Fight dental disease, wear and tear. Schedule your tooth restoration dental crown procedures today. 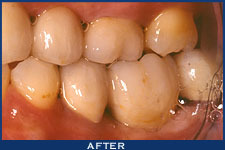 Through tooth restoration we use crown and dental bridgework. Tooth restoration replaces teeth that have broken off. Tooth restoration gives you new teeth so you can eat and talk without embarrassment or discomfort. Tooth replacement uses crowns and dental bridges to keep your new teeth working properly. Tooth restorations replace teeth damaged by old broken fillings. Tooth restoration relieves unexplained pain in your back teeth fillings, due to hairline cracks. This happens in the chewing part of your teeth. Dental crowns can stop teeth with root canals fillings from breaking.